We Help You Understand the Best Areas to Stay in Budapest! You’re considering heading to Budapest? Awesome! Perhaps you’re stopping in as part of your Eastern Europe itinerary? Whatever brings you to the awesome Hungarian capital – you’ll need sleep while you’re there! If you’re searching for the best areas to stay in Budapest, you likely have a lot of questions. 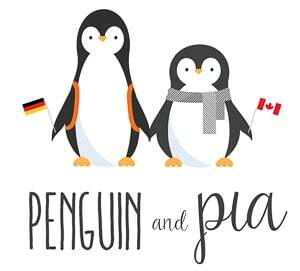 Don’t worry – because Eric is both Canadian and Hungarian and knows a thing or two about the city! For example, lots of people ask what the differences are between Budapest District V and Budapest District VII. It can be hard to understand without a comprehensive breakdown of the districts and something like a Budapest district map! We’ll cover some of the cool places to stay in Budapest as well as the best areas to stay in Budapest for nightlife. You won’t have to ask Lonely Planet about where to stay in Budapest when we’re done with you! There are some districts to avoid – but that’s simply because they are farther from the centre of all the action. In actual fact, some of the further districts have up and coming scenes for craft beer, and other things. 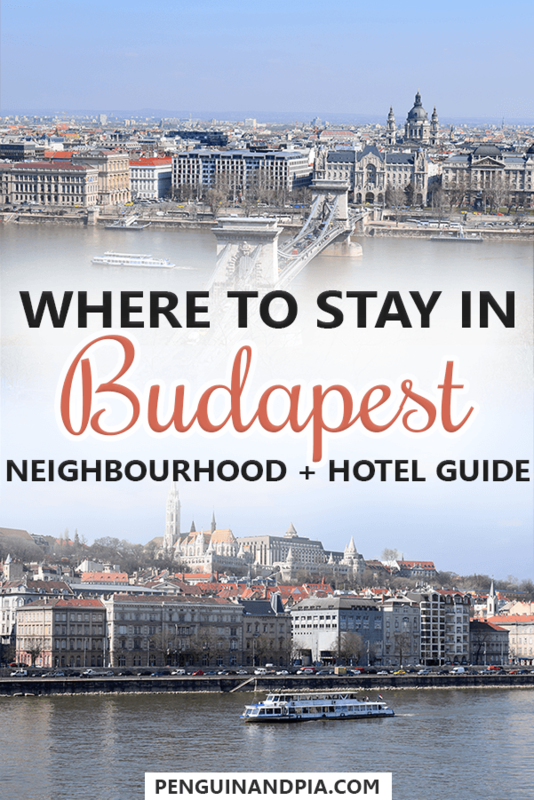 That said, our guide focuses on what many would consider the best hotel location in Budapest – the Inner City! It’s important to briefly mention the history of the city. Budapest is made up of three cities that merged in 1873. 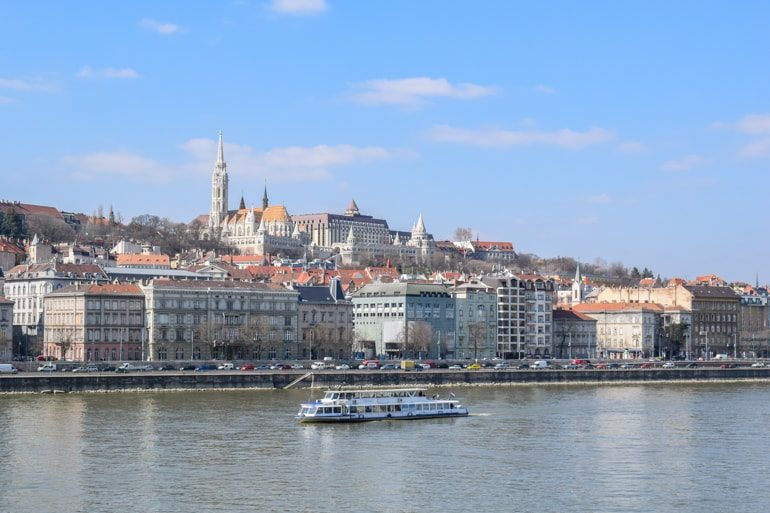 Buda is the hilly side of the river and Pest is the flatter side where most of the city lies. 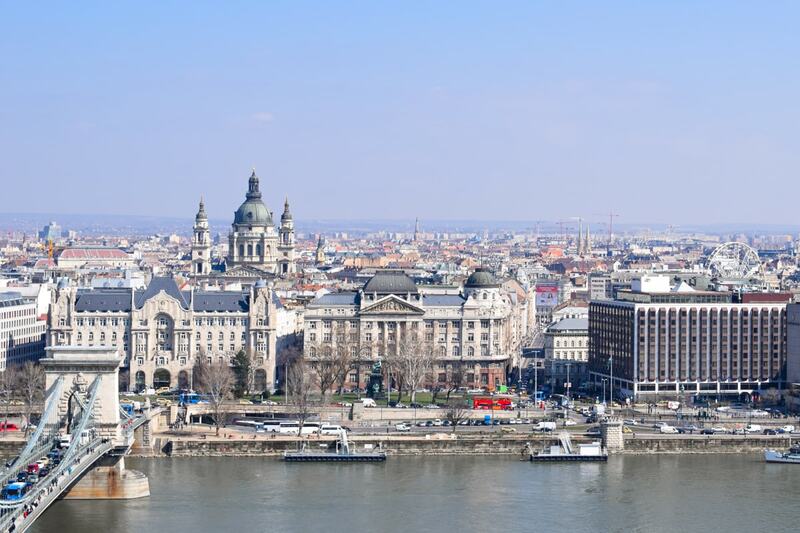 Together, along with a third smaller city of Óbuda – they make up the city of Budapest. As for the Districts, there are 23 districts around the Budapest area. They are designated by Roman numerals in a sort-of clockwise system around the city. In general, lower numbers are in the city centre while higher numbers are further out. For a traveller, this means that the more central you are to the Danube river, the closer you are to where the action is. This included the restaurants, tourist attractions, the river itself, historical things, bars and clubs, etc. Each district is divided into neighbourhoods. This means that even within an area, there are smaller areas with different characters to them. The shops will change, the people will change, the restaurants will be different, so it’s worth checking out an entire district before moving to the next one! Let’s dive into the Districts below. We chose to describe the most popular ones that tourists would consider booking their accommodation in. There are obviously 23 Districts – but we will only cover the major seven districts that touch the city centre. We’ll explain what’s in each one so you know which tourist attractions you can find close by. We’ll also describe the vibe in each one so you can determine what the best area to stay in Budapest might be for you. The Castle District from the Chain Bridge – some of the hotels below are in this photo! This is the “hilly” Castle district in Buda where many of the major attractions are located. It is historical, peaceful, and beautiful. You would be a quick walk to all of them and have great views. 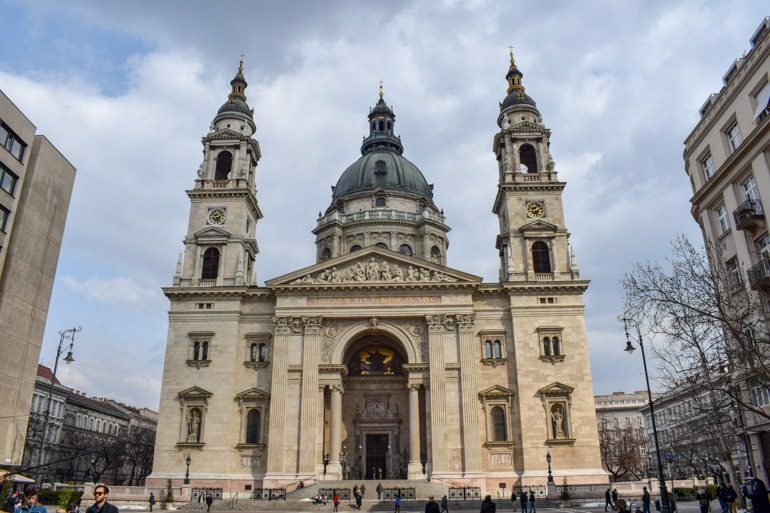 District I is known for: Buda Castle, Gellért Hill and the Citadella, Matthias Church, The Castle Hill Funicular (Cable Car), Hungarian National Gallery, Fisherman’s Bastion, and many, many more. Below are three of the top hotels in the Castle District area. 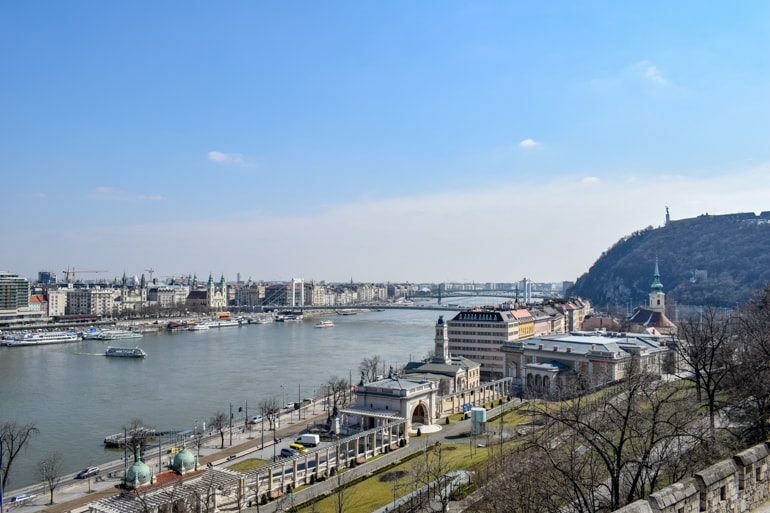 A commonality between them is their amazing location to the top attractions in Buda as well as their views of the Danube river. Honestly, a hotel in this area is never a bad choice. Feel free to check them out for yourself if you are curious – the cheapest one comes first! The Art Hotel is an affordable and classy hotel. Situated right on the bank of the Danube, guests rave about the views of the river and downtown Budapest. 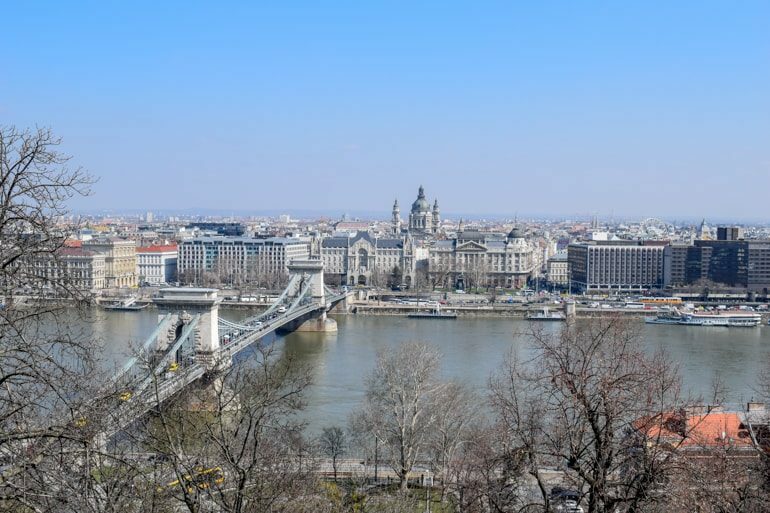 Being in District I, all the best attractions are very close by like the Chain Bridge, Fisherman’s Bastion, and more. You’ll also get a fresh breakfast, friendly staff, and on-site parking. The Carlton Hotel is a vibrant and renovated hotel. Completely redone in 2015, guests RAVE about the huge breakfast that is an assortment of hot and cold dishes which are replenished frequently. As with other hotels in the area, the location is perfect for all the best attractions in Buda. Guests can make use of the shuttle transfers and the hotel is rated as great for couples looking to relax or adventure. The Maison Bistro & Hotel is a boutique and memorable hotel experience. From the exceptional staff to the decorated rooms that are stylish and comfortable, your stay at the Maison is sure to please. The location is perfect and the details are always taken care of: from the interior garden to a great breakfast and even complimentary drinks on hot days. Known in English as the Inner City-Leopold Town, District V is what many would consider the touristy, lively, and historical part of Budapest. This is simply because of the number of attractions all condensed into one small area along the Danube River. District V is known for the most famous of attractions like: The Hungarian Parliament, St. Stephen’s Basilica, the Budapest Eye, and much more. Below are three of the top hotels in the area. Generally, these hotels are going the more expensive simply because the area is so central and allows for simple access to many areas of the city by walking, metro, or tram. You can click through to check them out if you are curious. As usual, the cheapest option is generally the first one! The Hotel Erzsébet City Center is a central and convenient hotel. This modern hotel is known for its amazing location close to the metro and Vaci utca pedestrian street where you’ll find lots of restaurants and shopping. The on-site steak restaurant and wine bar are a nice addition for guests. Guests also can’t compliment the staff enough on their attentiveness and helpfulness. The Hotel Parlament is a stylish and trendy hotel. From the fresh breakfast to the spa facilities and Lounge Bar, the Hotel Parlament has it all. The location is very close to the Hungarian Parliament – hence the name. The staff are raved about along with the complimentary daily beverages, large rooms, and overall experience! The Kempinksi Hotel Corvinus Budapest is an elegant and luxurious hotel. Rated a 9.7 by couples who stay there – the hotel boasts a Japanese restaurant, coffee shop, bar, pool, and spa facilities. Want an amazing location, modern rooms, and a relaxing massage while in Budapest? Then this is the place for you! Known as Theresa Town, this district of Budapest is fashionable, central, and cultural. The district itself is located along the famous Andrássy Avenue – a mecca for shopping, arts and and culture. Sound like the area for you? There are lots of bars and restaurants in the area. The attractions the district is known for are: Andrássy Avenue, Hungarian State Opera House, St. Theresa of Ávila Church, and the House of Terror Museum, among others. Below are a few of the hotels in Terézváros. The places to stay in District VI are all considered centrally-located with easy access to the “Oktogon” which is a station along the M1 subway line. You should be able to walk everywhere (if you can) but know that you are very well connected by transport in this district. Here are a few featured places to stay with great reviews! The most affordable option of the three is on the top! The Ibis Budapest Heroes Square is a comfortable and clean hotel. Located just steps from Budapest’s Heroes Square and the massive park with thermal baths and the Budapest Zoo. The breakfast buffet is fresh, there’s a terrace onsite, the staff is super friendly and the beds are comfortable. It’s also located near the oldest metro station in the city – making it easy to get into the centre! The 12 Revay Hotel modern and stylish hotel. Just looking at the photos tells you that this place is well put together. Couples who have stayed before have rated it a 9.6 – and for good reason. The rooms vary from doubles to apartments and some offer terraces. Guests love the breakfast, the amazing location in District VI, and the helpful reception staff they have on hand! The Callas House Hotel is charming and authentic. From the amazing design to the rooftop access for select terraces that let you soak in the city, this hotel thought of everything. The location is walkable to the best parts of Budapest but the metro stop is just steps from the front door. Book a stay and discover the city with your partner – you won’t regret it! Known in English as Elizabeth Town, District VII is known for the nightlife, energy, and the bars. The District is the smallest but one of the most populated in the whole city. This makes is a mecca for people to flock to after dark for food and drinks. As Budapest’s “Jewish Quarter”, some of the top attractions in the area are: Dohány Street Synagogue, Rumbach Street Synagogue, as well as the famous ruin bars – notably Szimpla Kert. Below are three of the top hotels in the area. It should be noted that this entire area is very central but will likely be loud, especially on weekends. If you are looking to have fun and be very social, then this is the district for you! Check out some of the places you can stay to be right in the famous Budapest nightlife. The cheapest option is at the top! The Garay Terrace Residence is a bright and simple accommodation. The location is close to Keleti Railway Station – perfect if you’re arriving by train. The rooftop terrace is huge and allows for sunbathing and views of the city. The friendly staff and the healthy breakfast make your stay a delightful experience. The Roombach Hotel Budapest Center is a colourful and modern hotel. Located right in the heart of the District, you can absolutely expect all the bars and restaurants to be outside. Don’t worry – the windows are soundproofed! Guests in the past have mentioned that because the staff are super friendly and the breakfast is great, this three star hotel is better than a 4 or 5 star! The Corinthia Hotel Budapest is a luxurious and boutique hotel. This 5-star hotel is more than a hotel, it’s an experience. From the international restaurants on-site serving your favourites to the Royal Spa guests have access to, the Corinthia is like none other. With a location close to the busiest areas but far enough to spacious and luxurious, check out the Corinthia Hotel Budapest. Beyond the Basilica and to the right is District VIII – where you find Keleti Railway Station. Translated in English as “Joseph Town”, Józsefváros is certainly one of the areas known to be up-and-coming, trendy, and social. Since there’s a university close by and a few green spaces, it’s a popular area with the younger crowds and university students. The area is a quick walk to the major attractions but the district itself features the: Hungarian National Museum, Keleti Railway Station, and Orczy Park/Garden. Below are three of the top hotels in the area. Again, this area is quieter and feels tucked away behind the major streets and busy areas in Budapest. This makes it slightly cheaper than other areas but you don’t have to sacrifice distance to the centre. You can click through to check them out if you are curious. Generally, these are all cheaper but the least expensive is at the top. Central Hotel 21 is a quiet and comfortable hotel. Tucked away in the heart of District VIII, the hotel has been described as a quiet oasis in the busy city. The rooms are clean and updated and breakfast, according to guests, is a simple spread of deliciousness. The staff are immensely helpful and the hotel is close to lots of the attractions nearby and a quick walk to the centre and the metro. The Three Corners Hotel Anna Superior is a stylish and modern hotel. From the great breakfasts to the very helpful staff, this newly opened hotel (September 2017) is already wowing guests with it’s clean and friendly atmosphere. The hotel is conveniently located a short walk to all the major attractions in the centre of Budapest at a price that is affordable and great value. The Hotel Palazo Zichy Budapest is a modern and authentic hotel. Described as in an area of Budapest with character and soul, the quiet street it’s located on is close to the tram – making exploring a simple activity. The modern furnishings, lobby bar, and comfortable beds are always talked about by the guests. Don’t forget the friendly staff and great breakfast at a very reasonable price! Known as Francis Town in English, District IX is quite large and is generally feels lively, local, and authentic. The district extends to the south west along the Danube River so it’s ideal to stay closer to the centre but still in District IX. Some of the attractions in District IX are: the National Theatre, Central Market Hall, the Palace of Arts, Zwack Unicum Museum, and the Holocaust Memorial Center. Below are three of the top hotels in the area. Generally, hotels in this areas aren’t as expensive. 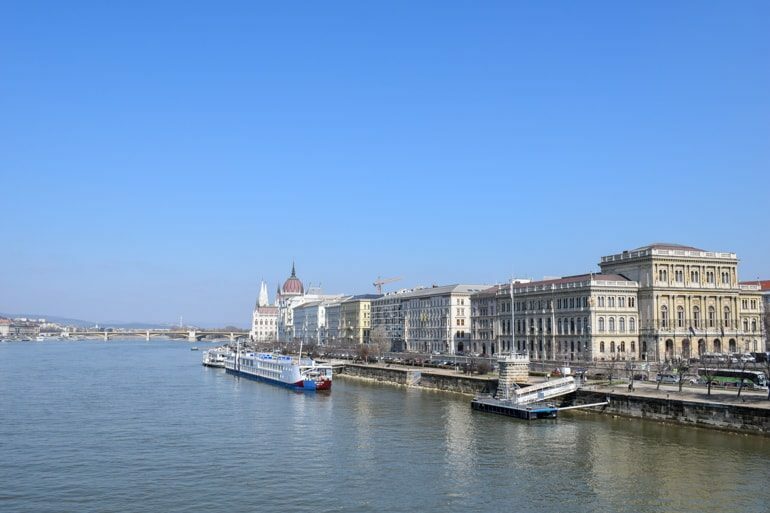 Depending on where you book, you might be a little farther out but it still won’t be a far walk along the Danube into the centre. You can also hop on the tram or metro if needed. You can click through to check them out if you are curious – they go from least to most expensive. The Three Corners Lifestyle Hotel is a simple and modern hotel. The location is quiet but still within walking distance to the city centre. The area is packed with restaurants and home to famous the Grand Market Hall in Budapest. The Three Corners has a terrace and a sauna and spacious rooms with really friendly staff that care about your Budapest experience. The Ibis Styles Budapest City is a chic and attractive hotel. Don’t let the brand name fool you – every room at this Ibis has a balcony and many overlook the Danube River. The Ibis is close to transportation to get into the centre but a quick walk along the river also gets you into the heart of the action. Friendly staff, and good breakfast in compact rooms make this the perfect cheap option. The Corvin Hotel Budapest – Corvin Wing is a renovated and simple hotel. The location makes for a quieter stay but, like many options in the area, is within walking distance to the centre and close to public transportation. Guests enjoy the breakfast buffet served from the international restaurant. The on-site bar is open 24/7 and the staff are generally very helpful and friendly. Beyond the Hungarian Parliament is District XIII – not far from the centre! District XIII is located to the north of the city centre District V and characterized by being calm, family-friendly, and peaceful. One of the major reasons for this is because District XIII includes Margaret Island – a natural green space int he middle of the Danube River. The island is a great way to escape the busy city life while not having to venture too far outside the city! Some of the attractions the area is known for, besides Margaret Island, are: St. Margaret of Árpád House Church, the Comedy Theatre, and Our Lady of Mount Carmel Church. Below are three of the top hotels in the area. We mentioned how popular Margaret Island is because two of the three featured hotels are ON the island! It makes for a beautiful setting to return to each evening. Also interesting to note that the hotels in the district and on Margaret Island are generally not as expensive as in other districts because they are “far”. In actual fact, you can absolutely walk along the Danube to the most important attractions. Have a look below if you want to stay on the Island! The Danubius Grand Hotel Margitsziget is a classic and quiet hotel. Built in 1873, the classic interiors don’t feel old and outdated but memorable and charming. Guests love the restaurant which serves all kinds of dishes and has a terrace view of the green park. Guests can even use the spa facilities at the nearby Danubius Health Spa Resort (featured below). The Danubius Health Spa Resort Margitsziget is a calming and peaceful hotel. Also located in Margaret Island, this hotel allows guests to fully relax while on their trip in the big city. The spa facilities and indoor and outdoor pools are all the rage with guests. The big breakfast buffet, helpful staff, and balcony to every room makes this hotel a unique stay on the green, lush Island in Budapest. The Danubius Hotel Helia is a modern and upscale hotel. Since the hotel is not located on the island, but on the mainland, you have perfect views of the island from the hotel. Guests love the huge pool, amazing breakfast, and two-storey fitness club with views of the Danube. The location (on the mainland) makes it even closer to the centre while still not being crazy expensive! And there you have it – a rundown of the best areas to stay in Budapest. Wherever you end up, you’ll realistically be within walking distance to the centre and all the action – or a just quick metro ride away. Each District has its own character so be sure to read about each one and really think about what kind of stay you wish to have in Budapest. There really is an area for everyone’s tastes and travel style. Have fun in Budapest and let us know where you end up staying – we’d love to hear about it!